Tartaric Acid Market size was valued over USD 450 million in 2016, and the industry will grow at a CAGR of upto 4.4% up to 2024. Tartaric acid is an organic acid, which can be manufactured from both natural and synthetic sources. Grapes, and sun dried raisins are the natural sources of tartaric acid. It can also be generated from the residue left after the production of wine. Synthetic tartaric acid can be made from maleic anhydride. Natural tartaric acid is produced in all countries, where wine production is predominant, while the synthetic tartaric acid is manufactured majorly in the developing nations of Asia Pacific, particularly in China. Usually, tartaric acid occurs naturally in grapes and sun-dried raisins. Tartaric acid finds a vast number of end-user applications such as wine, food & beverage, pharmaceutical, construction, and in FMCG products such as cosmetics & personal care products. It can be used as a raw material to produce emulsifiers, as an acidulant in manufacturing wine and beverages, as a buffering and excipient agent in pharmaceutical products. Growing wine consumption is leading to the increasing demand for tartaric acid, especially in the countries of the Asia Pacific and Latin America. The wine consumption in Argentina was 1,030 million liters in 2015 and is predicted to grow at a CAGR over 3.5% till the end of 2018. The wine and F&B sectors are the most significant consumers of tartaric acid. Rising consumption of nutritional drinks and bars, coupled with the development of beverages with different fruit flavors, will enhance the product demand over the projected period. Tartaric acid acts as a buffering and excipient agent for drug delivery systems. The demand for these agents is increasing at a significant growth rate, which will drive the tartaric acid market growth over the forecast period. Tartaric acid also finds applications as an anti-solidifying and set-retardant agent in cement production, and as an anti-caking agent in the processing of gypsum. The construction industry growth in some parts of Europe, and the Asia Pacific accelerated the need for construction chemicals, which would further stimulate the demand for tartaric acid in these regions. The prices of natural tartaric acid are higher as compared to synthetic tartaric acid globally. Moreover, these prices fluctuate, as per their availability which depends upon seasons. The global tartaric acid is further restrained by the restricted consumption of synthetic tartaric acid for food & beverage, pharmaceutical, and wine production. Moreover, tartaric acid market faces a moderate threat from growing citric acid demand, as it also finds competitive applications as an acidulant in many applications. Natural tartaric acid market dominates the global market, regarding both volume, and revenue. The demand for this product is predicted to grow at a CAGR over 3% in the projected period. Increasing product consumption in producing wine and some other beverages is anticipated to drive the product demand over the forecast period. 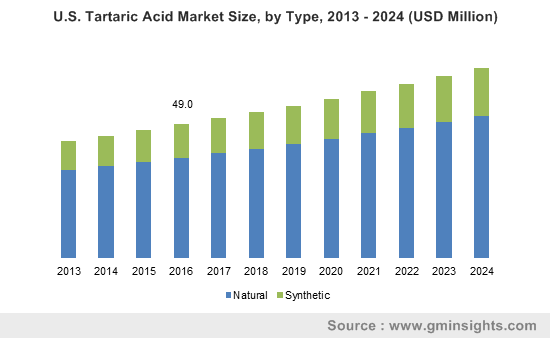 Synthetic tartaric acid is anticipated to surpass USD 150 million by the end of 2024. This product finds rising applications in manufacturing FMCG products such as cosmetics, personal care products, production of diacetyl tartaric acid esters of mono and diglycerides, and construction chemicals, thus the product demand is projected to grow with a lower rate compared to natural tartaric acid over the forecast period. 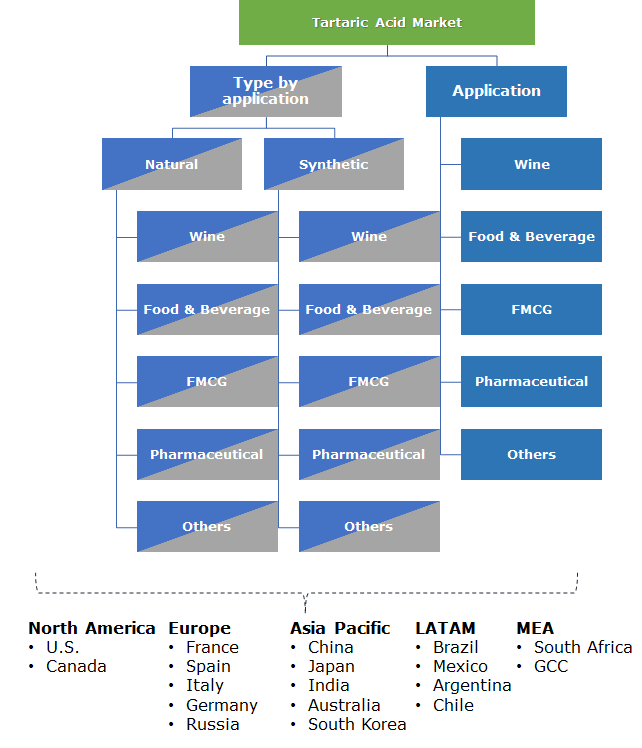 Global tartaric acid is segmented into wine, food & beverage, FMCG, pharmaceutical, and others. The product demand for wine production had the most significant market share in 2016 and would continue to dominate until the end of the forecast period. Increasing demand for wine will significantly drive tartaric acid consumption. The product demand from FMCG products such as cosmetics and personal care products is anticipated to have the second-major market share over the entire forecast period. This segment may grow at a CAGR over 3% until the end of 2024. Tartaric acid for food & beverage has the third-largest market share, regarding both volume, and revenue throughout the projected period. The product demand is also predicted to grow for food & beverages, as they are majorly consumed for flavor modification in beverages. Apart from beverages, and nutritional products, tartaric acid also finds applications in bakery products and various confectionary items. Europe tartaric acid market had a significant share in 2016 and will continue to dominate the global market till the end of forecast period. High wine production activities in European countries such as Italy, France, Spain, and Germany will drive the Europe tartaric acid market over the forecast period. Asia Pacific tartaric acid market had the second-major share of the global market in 2016 and will grow at a CAGR over 4% until the end of 2024. High product demand from pharmaceutical, cosmetics, personal care products, and construction chemicals will significantly drive the Asia Pacific tartaric acid market over the forecast period. Global tartaric acid market share is highly fragmented. Some of the major players are ALVINESA ALCOHOLERA VINICOLA S.A., Tártaros Gonzalo Castelló, Vinicas, Derivados Vinicos, Distillerie Mazzari, Distillerie Bonollo, Tarac Technologies, Omkar Speciality Chemicals Ltd, Changmao Biochemical Engineering, Merck KGaA, Caviro, and PAHI, S.L. among others. Players in this market are following various strategies to occupy a significant position in the market. For instance, a renowned cosmetics brand in U.S., Sephora, announced that it would start its operations in U.K. to anticipate the rising demand of tartaric acid based cosmetics. The demand for tartaric acid from the countries of the Asia Pacific and the Middle East are accelerating the product exports from North America and Europe. In Latin America, most of the product demand is from the countries such as Argentina, Mexico, and Chile. Moreover, the growing construction industry in the Middle East region will further drive the tartaric acid market growth till the end of the forecast period. The government regulations regarding the use of synthetic tartaric acid are expected to tighten over the coming years, which might act as a significant restraint to the tartaric acid market growth globally.